Click this thumbnail for a full-size version of "Flowers for Trinitron"
For the past two months, Nan and I have been without TV. The neighbors next door to the house we are renting in Basalt had some excavation work done around their foundation back in June. In the process, our cable was cut, or more likely it was just disconnected since I finally traced the cable back to its end and there was still a muddy connector attached. It turns out it was not a legitimate hook-up, which meant there was no calling the cable company to get it reconnected. We stewed about this for quite a while, partly not wanting to pay for something we had been getting for free and partly out of fear that there would be repercussions if we called the cable company to order new service. For the first couple of days, we would turn on the TV periodically to see if by some miracle the service was back on, but all we ever got was a blue screen. We didn't miss it in the mornings when we normally listen to NPR on the radio, but there was a definite void in the evenings. Fortunately, it was the summer rerun season, so we weren't missing much. Still it would have been nice to watch the news or a sports event or an HBO movie once in a while. Instead we would read both Aspen daily newspapers, follow sports on the Internet, and watch DVDs on my laptop. Nan spent more time emailing family and friends, and I spent more time practicing guitar. We went to bed earlier and felt better rested and more productive at work. 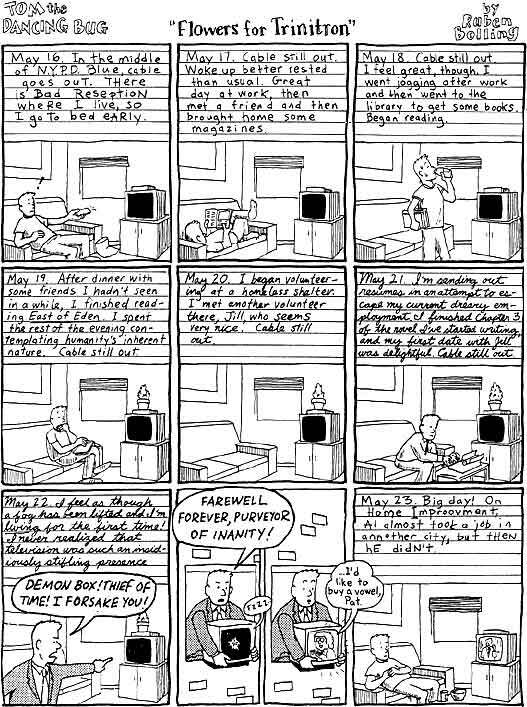 It occurred to me after a couple of weeks that we were living Ruben Bolling's "Flowers for Trinitron" existence, based on one of his old Tom the Dancing Bug cartoons. Hopefully, we won't see it through to its logical conclusion and return to our previous viewing habits, even though we recently gritted our teeth and ordered new cable service--without threat of arrest!--in time for football season. Go Packers!